TORONTO, ON – Folly Brewpub has announced the release today of the first in a new series of barrel-fermented farmhouse ales. Many barrel aged beers have the beer fermented in stainless before being transferred into an oak barrel. For the Invented Tradition series we are fermenting 100% in oak barrels (kinda like a mini foder) for two months to provide a light oak character and a robust mixed fermentation. This version was brewed with oats and rye and fermented with a saison yeast and several brettanomtces strains. It has a bright lemony acidity, with hints of soft oak, vanilla, earthy funk, and stone fruit. The finish is dry and peppery from the rye with a hint of oak tannin and bitterness. Ideally this is a complex but understated beer. 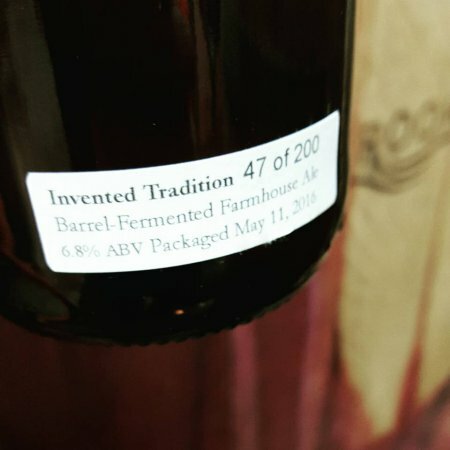 Folly Invented Tradition #1 will be released at the Folly retail store today (May 13th) at 4:00 PM in an edition of 200 bottles, selling for $8 per bottle with a limit of four per customer. A single keg of the beer will be tapped at the brewpub bar at the same time.